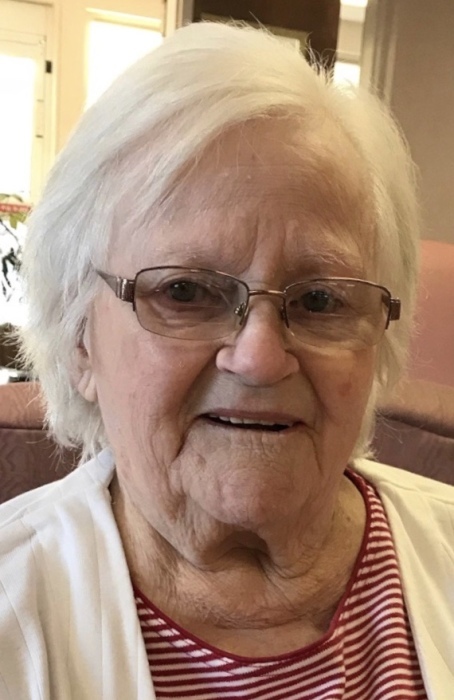 Olive E. “Sister” Russell, 94, of Saxton, PA; passed away on Friday, November 30, 2018 at The Village at Morrisons Cove, Martinsburg. She was born on March 21, 1924 in Saxton, Pennsylvania; a daughter of the late Gilbert Alan and Mae Lucretia (Elder) Clapper. On June 12, 1948 in Trinity United Church of Christ, Saxton; she was united in marriage to John H. Russell. He preceded her in death August 3, 1963. Olive was a single parent (before the term was coined and before many realized what the description entailed) whose life revolved around her children, grandchildren and family. She is survived by children John G. “Jack” Russell married to Vickie (Heckman), Saxton,and Jill M. married to Dennis Clawson, Saxton; three grandchildren Dennis James Clawson, of Saxton; Jacklyn (Russell) married to Joel Bookhammer, Woodbury, PA and Caitlin (Clawson) married to John Byron, Washington, PA.
She was preceded in death by treasured sister and brother-in-law: LaDonna and Patrick Smith. Mrs. Russell was a member of Trinity United Church of Christ, Saxton, where she attended regularly and was active in the Mite Society at the church. She was a graduate of Saxton Liberty High School Class of 1942. Retiring from R&R Vending as a secretary, she had worked through the years at the A&P Grocery Store, with Dr. W.J. Thomas, and at the Quality Manufacturing Co. She enjoyed participating in the Neighborhood Coffee Clubin the 1950’s. Olive loved children and their antics. She had a special affinity to the children she had babysat through the years while their parents worked. Friends may call at the Akers Funeral Chapel, 715 Church Street, Saxton, PA Monday December 3, from 6:00 - 8:00 pm. A service for the Celebration of life will be held on December 4 at 11:00 am at the Akers Funeral Chapel withthe Rev. Jerry McCuller officiating, assisted by Pastor Jack Russell and Pastor Jill Clawson. Burial will be held at St. Luke’s Cemetery, Saxton. If friends so desire, memorial contributions may be made in memory of Olive Russell to The Good Samaritan Fund of the Village at Morrisons Cove. Living at the Village for her final four years, her life was deeply enriched by the loving care, spiritual nourishment, and diverse activities of a staff she considered her friends.